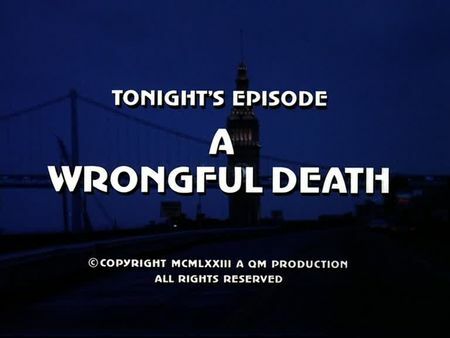 I have just added the screencaps for A Wrongful Death to the episodes' page. Being on duty at night, Mike and Steve are responding to an emergency call of a police patrol at a shopping center at Fishermans Wharf. A group a youngsters is committing a burglary, snitching electronic devices. Two of the boys are keeping cave, while the older guys are collecting cameras and other kind of electronics. When Mike and Steve arrive on the scene, they find one of the police officers wounded in his car. Steve soon chases two of the youths through the gloomey shopping complex and, following a warning to freeze, shoots at the one who just turned to him with a gun in his hand. Both of the boys can make it into a corner with Steve being on their trail. When he arrives, he finds one of the suspects dead on the ground, the other one disappeared - just like the gun did. Although Mike appeals to his conscience, the situation leaves Steve with doubts about what he actually saw and did. The testimony of the other young boy - who had been seized just hours later - as well as the wounded officer are fuelling Steve's doubts. The grieving father, Al Davies, calls for vengeance, being convinced that his son, Spencer, would have never been involved in a robbery or anything illegal at all. We soon learn there is a certain dissension in the family, the mother deceased several years back, and the older son and brother of the killed boy, Jack, is not that much of an honest kid. Steve is temporarily exempted from duty, with police and District Attorney Gerry O'Brian trying to solve the case. Mike soon investigates among the friends and families of the boys, and a particular observation made by the wounded officer provides a decisive lead. This episode takes us from Fishermans Wharf and Downtown San Francisco up to Potrero and Dolores Heights. The nightly robbery was committed at the Cannery, still a famous shopping center at Fishermans Wharf. Al Davies' bar, 'Pastine's Dugout', was located on Kearny Street (close to Market), and the Davies house can be found on Noe Street, close to the intersection with 21st Street. Mike and Steve return to the Cannery Courtyard when Steve, dismissed from duty, is trying to find the gun himself. Mike investigates at the Downtown High School on Potrero Hill, and accidently comes across suspect Lonnie Carter, whose mother is questioned in front of their appartment on Southern Heights Avenue. Mike chases Carter at famous Ripley's Believe It or Not on Jefferson Street (still existing) and finally detains him at Old San Francisco (now closed) which used to be located next to Ripley's. Also on Jefferson Street at Fishermans Wharf, Jack Davies is trying to exchange the money made from the robbery for drugs. The final scene was filmed at the historical Hyde Street Pier.